Castaway Critters Kids Mystery Party will have your youngsters scrambling to save a boatload of adorable pets shipwrecked on Cougar Island. A dastardly villain had made off with the Captain’s treasure – treasure desperately needed to pay for the pets’ passage to safety. 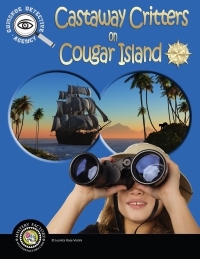 Find the treasure before the critters become cougar crunchies! It's a party in a PDF, with everything needed for a first-class event for home parties, library fun time, or summer camp. Codes & clues included.